District Attorney John Chisholm’s effort to silence his staff “appears to violate the Constitution,” says a nationally renowned expert on whistle-blower law. Brian Mahany, a Milwaukee-based fraud recovery and whistle-blower claims lawyer who brings a resume fat with legal wins, says it appears like the Milwaukee County District Attorney’s office has something to hide. CONSTITUTIONAL QUESTIONS: Former New Orleans assistant district attorney and whistle-blower law expert Brian Mahany says the Milwaukee County District Attorney’s gag order on his staff raises some key constitutional questions. “This policy extends to contacts with staff members of any elected official,” the memo concludes. Lovern has not returned several calls from Wisconsin Watchdog seeking comment. It’s not clear why the agency issued the gag order, but it comes in the wake of a controversial Milwaukee Police Department technology failure that sources say could derail hundreds of criminal cases sent to the DA’s office. 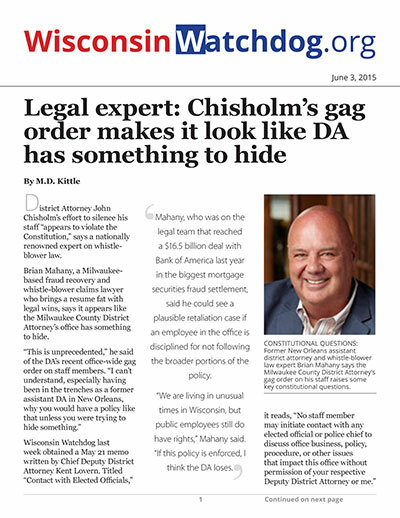 Milwaukee County District Attorney John Chisholm is no stranger to First Amendment problems. For five years, the Democrat and his office has been integrally involved in politically charged John Doe investigations into Gov. Scott Walker’s campaign, his former aides and conservative allies. The investigations came with secrecy orders that an appeals court judge called “screamingly unconstitutional.” Targets of the probes could go to jail if they discussed the probe with anyone but their attorney. Mahany called the DA’s interoffice policy “completely overreaching.” He said if the directive simply said only certain people are allowed to talk to the media, he could understand the DA’s stance. “This memo appears to cover everything, including contact with the very people DA staff work with on a daily basis,” the attorney said. Constitutional law expert Rick Esenberg said the DA’s policy appears to meet U.S. Supreme Court cases laying out the boundaries of free speech in the public sector. “That is potentially broad,” said Esenberg, president and founder of the Milwaukee-based Wisconsin Institute for Law & Liberty. “You have to concern yourself with the breadth of that language and understand that there could be protections for whistleblowers that override any attempt to sanction an employee for violating a policy,” he said. Mahany said the policy could create some legal liability for the DA’s office under whistleblower protections. Mahany, who was on the legal team that reached a $16.5 billion deal with Bank of America last year in the biggest mortgage securities fraud settlement, said he could see a plausible retaliation case if an employee in the office is disciplined for not following the broader portions of the policy.